THE WORDS IN THIS HYMN are my most cherished of Easter songs. For these verses I sang as a child each Easter in the balcony of St. John’s Lutheran Church, Vesta, Minnesota. Dressed in a new cotton Easter dress, feet strapped into shiny patent leather shoes, a hat streaming ribbons down my back, I sang with enthusiasm. I know that my Redeemer lives! Loud. Joyous. From the soul. The imprint of this hymn remains with me decades later, far removed from the church of my youth. I can still sing the words from memory. I can still feel the stiff cotton of my new dress, hear the organ music rising and falling, smell the lingering scent of cows on myself and classmates, taste the sweetness of Easter candy upon my tongue, see the temporary Easter tattoos pressed upon my arm. In this rural church, gathered with other farm families, I celebrated Easter. Today, decades later, in Trinity Lutheran Church 120 miles to the east, I know (still) that my Redeemer lives! TO MY DEAR READERS, may you celebrate a joyous and blessed Easter! WE FILED INTO THE BALCONY of St. John’s Lutheran Church, Sunday School children clunking up the stairs in our shiny patent leather shoes. I felt a tinge of nervous energy fueled by too much chocolate taken from Easter baskets and eaten for breakfast. My vintage 1960s purse, reclaimed years ago from my mom’s toy box. I was dressed in my Easter finery—lacy anklets tucked into shiny shoes, lime green skirt skimming my knees below a sleeveless floral shirt accented by a matching lime green jacket. I carried a lime green purse. I looked as fashionable as a skinny Minnesota farm girl can in a homemade ensemble topped by an Easter hat with ribbons tailing down the back. I know that my Redeemer lives! What comfort this sweet sentence gives! He lives, he lives, who once was dead; He lives my everliving head! Art of the risen Lord photographed inside St. Mary’s Catholic Church, New Trier, Minnesota. In the balcony of that rural Minnesota church, I sang with enthusiasm and joy of my Redeemer. Eight verses. The voices of farm girls and boys singing with such gusto. Every Easter. The words are still imprinted upon my memory more than 50 years later: I know that my Redeemer lives! And I still sing them with joy. MY DEAREST READERS, may you be blessed with a joyous Easter. The Lars Larson log cabin sits next to the water tower in Wanamingo. The blue grey structure to the right is the information center. IN THE UNLIKELIEST OF PLACES, beneath an aged water tower and next to an historic log cabin, an unexpected bit of Wanamingo’s history is revealed. It is typed on sheets of paper sandwiched under Plexiglas in a handcrafted case labeled Information Center. The song: It Is Well With My Soul. The writer and composer’s names are highlighted in blue. It is the story of the beloved hymn, It Is Well With My Soul, and its link to this Southeastern Minnesota farming community of nearly 1,100. My lips move in silence as I read the familiar words, the familiar melody chorusing comfort. It is well, it is well with my soul. The story of the Spaffords and the hymn, along with images, is posted. I’d never considered the story behind the words. But now that I’m reading about Horatio and Anna Spafford’s personal tragedy, I am deeply moved. The couple lost their four oldest daughters at sea when the Ville du Haure collided with an English sailing ship en route to Europe in 1873. Only Anna survived, cabling her husband, who remained back home on business, with two words: Saved Alone. During his voyage to see his grieving wife, Horatio penned It Is Well With My Soul. Three years later, Philip Bliss composed the accompanying music. This sign marks the log cabin. But what does any of this have to do with Wanamingo? The connection begins about two decades earlier when 14-year-old Anna Larson journeys to Wanamingo Township from Chicago to be with her ill father. Lars E. Larson moved to Minnesota the year prior in hopes farming would improve his health. He died in the spring of 1857, within a year of Anna’s arrival. That same year, Anna, 15, met her Sunday School teacher, 29-year-old Horatio Spafford. In 1861, she married Horatio, a then successful Chicago attorney. Within 10 years, the Spaffords have four daughters. And then those girls are dead, drowned at sea. Their mother, Anna, survives, kept afloat by a plank until she is rescued. How many people drive by this log cabin on Main Street in Wanamingo and never stop? I was tipped off by a local to the story I’ve shared here, thus I stopped. Having read this story behind the familiar hymn while standing in the shadow of the Wanamingo water tower next to the Larson log cabin, I am moved. I am moved by the faith of Horatio Spafford who, in sorrow rolling like sea billows, penned such profound and comforting words. It is well, it is well with my soul. FYI: Check back tomorrow for another post in my “from Wanamingo” series. I will take you inside Trinity Lutheran Church. 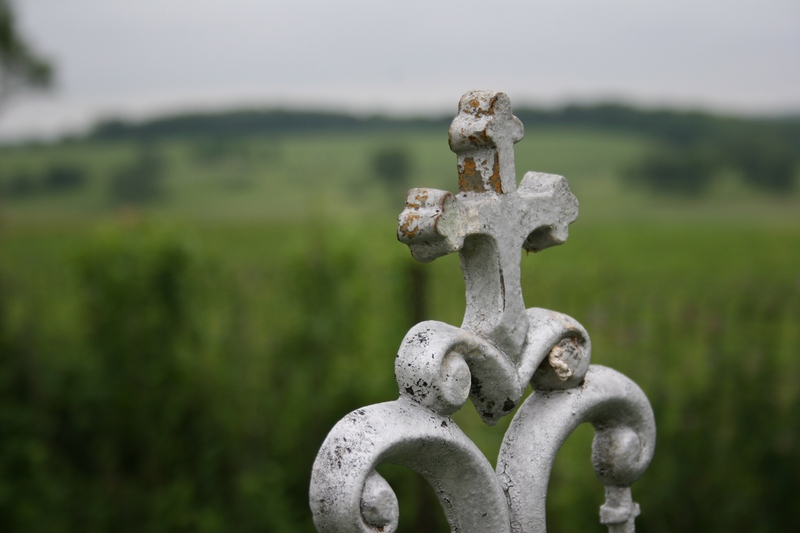 A cross in Trebon Cemetery, 10 miles northwest of Faribault in Shieldsville Township. This, one of my favorite hymns, I sang with the congregation of Trinity Lutheran Church in Faribault this Easter Sunday morning. The words are imprinted upon my memory from childhood Easters, of singing from the balcony of St. John’s Lutheran Church in Vesta with my Sunday School classmates. I know that my Redeemer lives. I knew that then. I still know that now. He is risen. He is risen, indeed. Wishing you a most blessed Easter in our risen Lord.